My Story of Why I Do What I Do. I do what I do because there are voices that are never heard, lives that slip through the cracks, and dreams that have no chance of becoming a reality. Here is one cry for help from a student a few years ago. “I’m losing my job. I get paid too much and I’m losing my health insurance. They took away my family’s food stamps too. So I can’t work anymore and I still don’t have health insurance. I was working at Equinox Village as a waitress, about 25 hours a week. We were supposed to get insurance and food stamps back on October 1st. My mom is mentally disabled so she doesn’t work. My dad works as a mechanic but he doesn’t get paid too much. I have a brother who dropped out of school. He now works as a mechanic with my dad. When I wake up, I brush my teeth, get dressed and go to school. I pick up a friend who doesn’t have a ride to school. School is complicated. Too much work in one day. It is hard to work so much and have school work afterwards. I can’t ask my family to buy me things; they don’t have the money for it. School doesn’t seem like it is preparing me for much. I want to go into nursing. After work I go home, do some homework and go to bed. I pay for my own car, gas, I do my own laundry. We have no water pressure. We have a two bedroom trailer with 5 people living in it. There are three people sleeping in my bedroom. We have 2 dogs. We don’t have any drinking water; we haven’t since school ended. We have to buy it at the store. My aunt lives with us. She couldn’t take it where she was living in North Carolina. She is also mentally disabled, so she can’t hold a job. She has no where else to go. At work they usually give us food, which is where I eat supper. Supper at my house is vegetables out of a can or out of a box, because it is cheaper that way. We can spend $50 a week on food ($10 per person). My dad makes sure my brother and I get food first and then the adults later. But I stop myself from eating when I see there isn’t much left. Sometimes I buy groceries for the house with the money I make at work. We don’t have a phone at my house; it is too expensive. A couple of times they have turned off our electricity because I can’t pay the bills. Today this student is a nurse. She attended college. I had a hand in that. 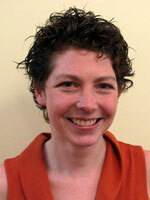 Rowland Fellow Kendra Larson is a member of the 2011 Cohort and is a Social Studies teacher at Burr and Burton Academy. Her work as a Fellow there continues to focus on supporting students in poverty through directed academic interventions along with developing habits of mind for all. This is a chapter from Kendra’s story. Tell us yours. 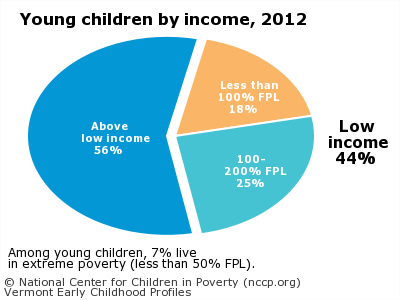 Vermont Early Childhood Profiles: 44% of Vermont children live in low income households.